The Sony KDL-55W955B is the maker's Full HD flagship TV and introduces a new form factor for flatscreens: the wedge. Thanks to a wider base, the set is able to accommodate a pair of decent, downward-firing Long Duct speakers, promising a significantly better audio performance than traditional waif-like panels. It also looks distinctly cool in a Shard-like way. 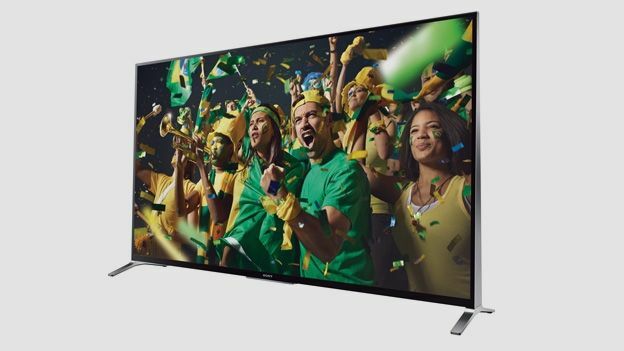 The screen is also available in 65-inch guise, as the Sony KDL-65W955B. Its principal competition is the curved Samsung UE55H8000 Full HD model, and the altogether more normal 55-inch LG LB730V. Sony's made some big changes to its Smart platform this season. Apps are now presented full screen, and there's plenty to wade through, including BBC iPlayer, Demand 5, Amazon Prime Instant Video and Netflix. A new Discovery bar filters content from multiple sources, made easier to navigate with a new touch-pad One-Flick Bluetooth remote. There's also Social View, which combines live broadcasting with a live tweet stream, and a dedicated Football mode. The wedge design is nothing if not Marmite. Those that worship at the alter of the superthin will need to re-educate their taste buds. With metallic end plates and an artfully rolled top, the W95 is all kinds of different. While the set's wide pedestal stance may not suit all AV furniture, the feet can be moved closer together using a secondary central fixing point. This pinched look appears a bit odd though. Connectability is good. There are four HDMI inputs, three USB inputs (one of which can be used for HDD recording), Ethernet, Scart, component video, headphone jack and CI slot. There's also an optical digital audio output. Wi-Fi is built-in. The set has single terrestrial and generic satellite tuners. There's also a Skype camera that plugs into a dedicated rear USB port on the back, and peeps over the bezel. Generally speaking, image fidelity is fine. Full HD picture detail is emboldened by Sony's new X-Tended Dynamic Range and Triluminos colour processing. If the screen has a flaw, it's that it can't deliver deep blacks; this is most apparent when you view in full darkness. Motion handling, always a Sony strength, is excellent though. The set warrants Motionflow XR 400Hz certification, and comes with a heap of interpolation modes. Our recommendations are Motionflow Clear, which delivers 1080 lines of moving resolution, and Standard. Fast moving sport looks great on this set. Predictably, the TV's audio performance is strikingly good. Clever long duct speakers and ClearAudio+ processing are used to create a really solid soundstage. Onboard S-Force 2x10w digital amplification delivers considerable volume. If you need more bass, Sony also offers an optional wireless subwoofer. There's plenty to admire about this big Sony. While audacious, it transpires that the wedge design offers genuine benefits when it comes to audio performance; there's no soundbar needed here. Image clarity and colour are high, black level limitation not withstanding. Smart functionality is also accomplished. We really like the One-Flick Discovery bar which runs across the bottom of the screen. Offering thumbnail recommendations for content, it's a winning addition. Overall, we reckon this stylish Full HD screen is well worth auditioning, particularly if great sporting performance is a primary goal.